Select “Batch Download Replay Data…” menu item. 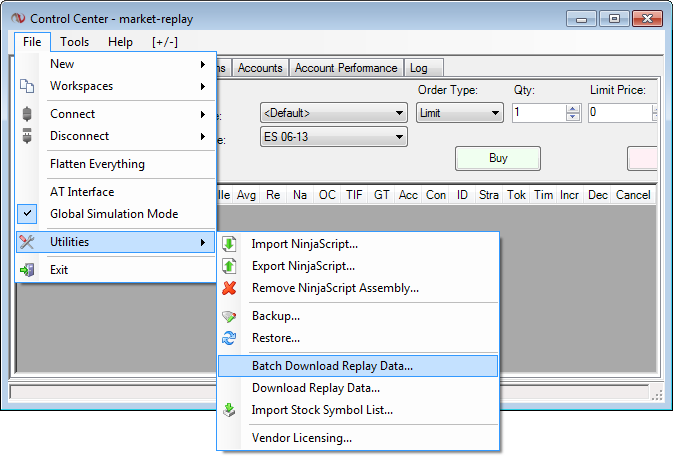 A dialog box with MarketReplay downloader will appear. Select instruments and a date range and click “Download” button. This is a normal download. New data will be appended to the existing one. Choosing this option means that ALL your existing data will be replaced with the data you are about to download (even if you have chosen a different date range). Example: you had all March 2013 data for /YM and /TF, but you have just chosen to only download /YM April 2013 data. After the download you will only have your /YM April 2013 data. (All of your /YM and /TF March 2013 data will be erased). However, if you have previously used MarketReplay Downloader to retrieve your /YM and /TF March 2013 data, it will be stored in a local compressed folder. 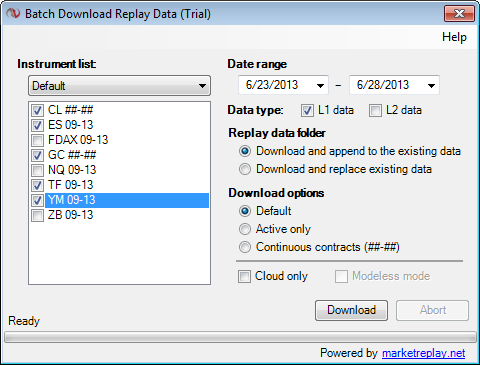 Later on, if you decide to use MarketReplay Downloader again to get the same data, it will be restored from the compressed folder, which could save you a lot of time. You will download a data selected in the list of instruments for the specified date range. You need to pay attention whether or not a particular selected instrument is active for a specified date range. 6E 03-13, 6E 06-13, 6E 09-13 and when requesting the data from January 2013 till September 2013 a corresponding active contract will be loaded 6E 03-13 for the January-March period, 6E 06-13 for the March-June period, 6E 09-13 for the June-September period That being said you won’t get any data for 6E 09-13 for January because it was not active. All the data in replay folder will be downloaded in the form CL ##-##. In the selection list you need to use either continuous contract or normal contract. You need to use CL ##-## on all your charts, strategies, Market analyzer and SuperDom to play in simulation. Please note that if some of the dates are holidays or non-trading days a warning message will appear on the screen. This message will be automatically closed. When downloading a progress bar will appear and the download process may be cancelled at any time by pressing “Abort” button. If you see “Downloading Level I replay data” message in NinjaTrader Control Center’s status bar it means the data is being downloaded from NinjaTrader servers.